Although their Facebook page reported fewer – some 46 people confirmed their attendance at the casting call – the auditions seemed steady on Sunday, the second day of the casting call. 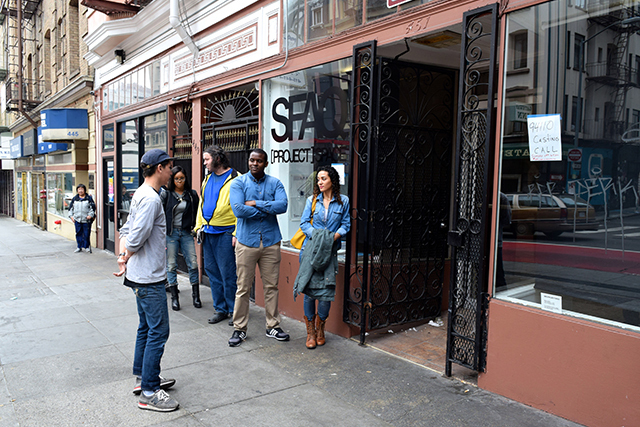 The line in front of the SFAQ Project Space in the heart of the Tenderloin varied between 5 to 10. 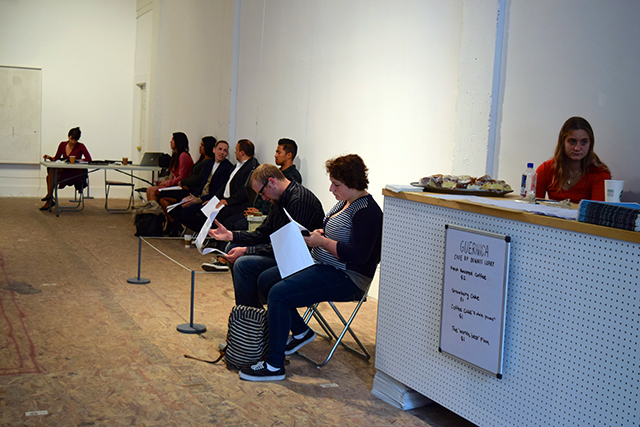 Inside the recently opened art space, another group of 15 fairly diverse candidates waited to audition. Some of the attendees gave submissions online, but most of the casting, was first come, first serve. When the room filled up, a guy dealing with the participants outside, gave them a numbered ticket to return for a later appointment. “My fiancee told me about the audition and I just wanted to see how my luck would work out,” said Johnas Street, an actor and American idol finalist whose credits include some TV shows on BET and an appearance in the James Brown bio Get on Up. “I worked for Intel (as an analyst), so I guess I am pretty knowledgable about the tech industry,” he added with a big smile. Both seasoned and rookie actors could read the script online or find copies inside to cast for one of the six leads: the spazzy neurotic boss, the ambitious smart entrepreneur, the socially awkward engineer, the timorous hard working programmer, the sharp techie always there for the gang, or the likable Bro with not much talent. The three supporting characters include a venture capitalist, a super confident guy who uses guerrilla marketing for his apps, and one struggling Mission neighbor, who works insane hours and hustles to make the monthly rent. Most of the roles are not gender specific, but there were only a few women there on Sunday to audition. Here is the monologue Dan Raile, a veteran as an extra in a couple of student films, read for his audition as the Mission neighbor. Before he walked into the audition Raile said, “There are not a lot of opportunities for non-union acting in SF, so I thought it would be interesting thing to try out..I think it’s possible to represent the tech industry’s impact on the Mission reflecting reality, and art reflecting reality is a goal. I think the whole polemic about the techies and the neighborhood is a little bit putting the cart before the horse.” The polemic Raile was referring to was the negative reaction to the casting call on Facebook. “I have lived in the Mission for eight years, and I had to move out last year because all of the gentrification issues… so it caught my attention that someone is making something like this,” said Cameron L., who said he had no acting experience, but had appeared in a few music videos. He insisted that he and all the production team are Mission residents and have their own opinions about the changes in the neighborhood – changes that will be portrayed in the show.